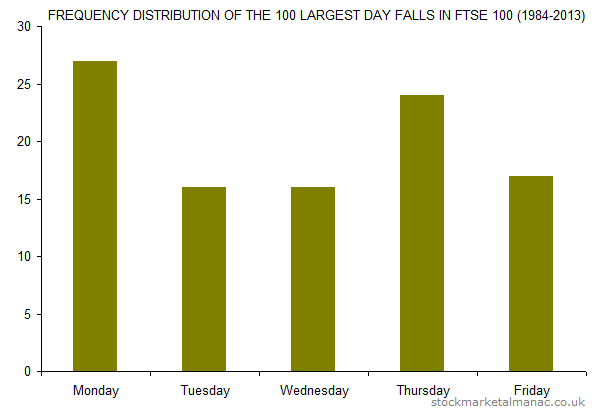 Previously we’ve looked at the daily volatility of the FTSE 100 Index (here and here), in this article we will look at the average weekly returns and volatility of the Index. 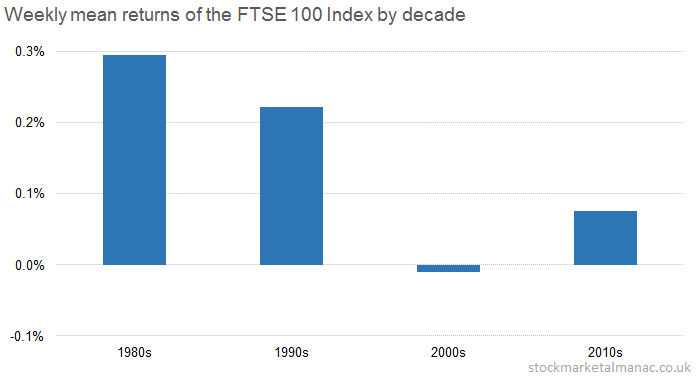 Since 1984, when the FTSE 100 Index was introduced, the mean weekly return of the index has been 0.13%. In other words, when the index is at the 6000 level, the average change in the index in a week has been 8.1 points. However, this single figure masks how the mean return of the index has changed by decade – this is shown in the following chart. In the 1980s the mean weekly return was 0.29%, which then fell to 0.22% the following decade (which marked the end of the 20-year asset boom). In the 2000s, the mean weekly return fell to a negative -0.01, and so far this current decade the mean has been 0.08%. Although the current decade’s mean weekly return has been 0.08%, the standard deviation is 2.1 (standard deviation is a common way of measuring volatility). This means that with the index at the 6000 level, for 32% of weeks the weekly change has been greater than -122pts or +131pts. How has this weekly volatility changed over the years? As can be seen, there have been some obvious spikes in volatility – notably during the 1987 crash and credit crunch in 2008. But overall the general level of weekly volatility of the index has not changed significantly in the last three decades. In fact the average standard deviation since 1984 has been 2.1 – so the current level of weekly volatility is pretty much exactly at the mean level for the past 30 years. And, at the risk of getting too iterative, the standard deviation of the mean of the standard deviations of the rolling 10-week returns of the index is moderately low at 1.1; meaning that for 68% of all 10-week rolling periods the volatility is between 1.0 and 3.9. Extract taken from the The UK Stock Market Almanac. Order your copy of the just published new edition now! A previous post looked at the average cumulative stock market returns throughout the year January to December. 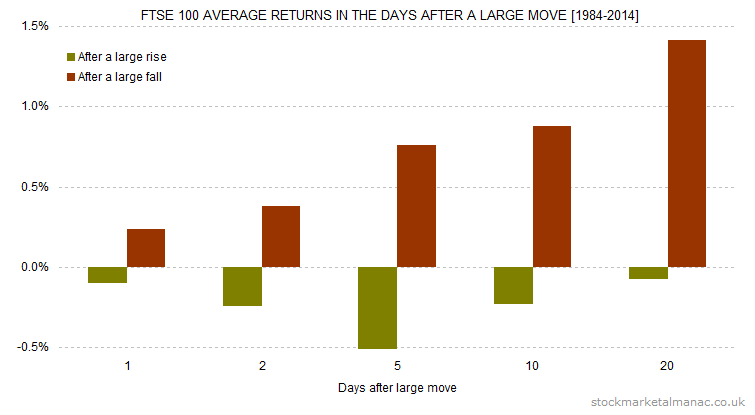 Beyond simple mean returns, it can also be interesting to look at how the market’s daily volatility changes throughout the year. 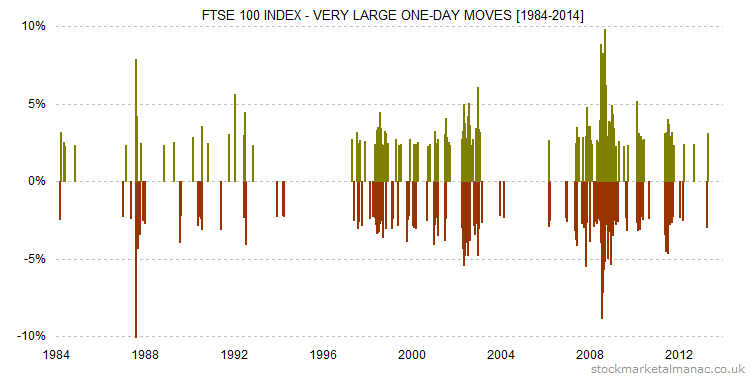 The following chart shows the (5-day moving average of the) standard deviation of the daily returns throughout the year for the FTSE 100 Index from 1984 to 2015. 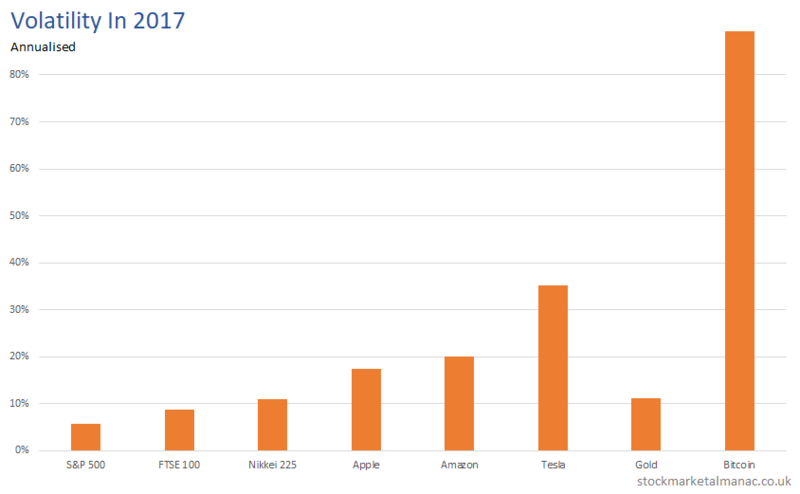 In plain English: the chart plots the range of daily fluctuations of the FTSE 100 index for each trading day throughout the year. It can be seen that the volatility of daily returns is fairly even for the first eight months of the year; it then starts to increase in September and peaks in October before trailing off fairly significantly for the remainder of the year. 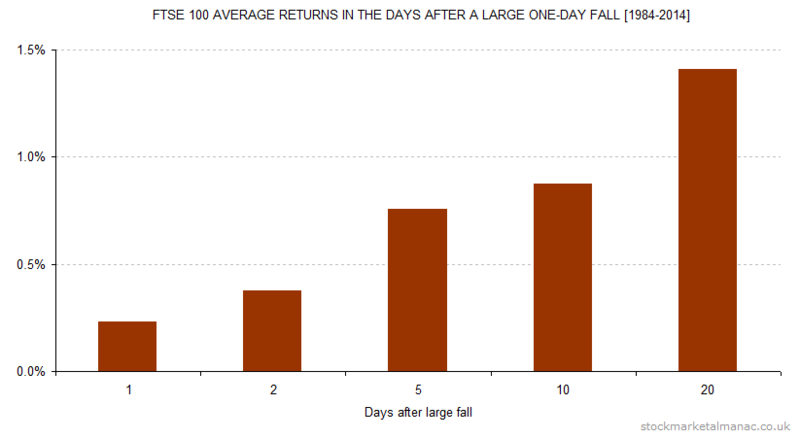 So, according to this study of daily returns throughout the year, October is the most volatile month. October has a reputation for being a volatile month for shares – is this in fact true? The standard way to measure volatility is to calculate the standard deviation of returns (in this case these will be daily returns). 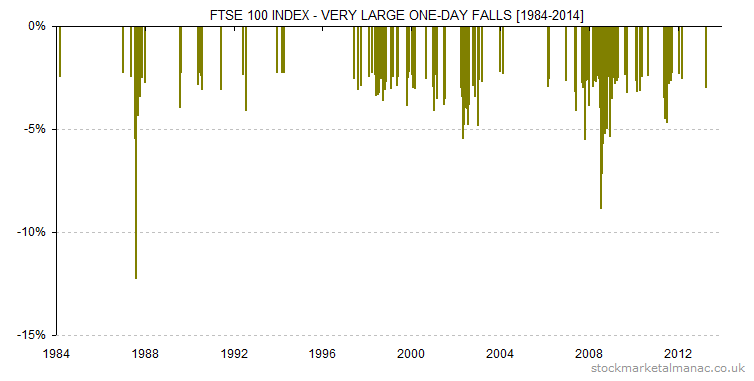 The following chart plots the standard deviation of the daily returns of the FTSE 100 Index for each trading day of the year for the period 1984 to 2014. For example, the standard deviation of the 30 daily returns on the first trading day of the year since 1984 is 1.37. To smooth the line what is actually plotted is the 5-day rolling average of the daily standard deviations. It can be seen that the volatility of daily returns fluctuates in a range of approx 0.8-1.2 for the first eight months of the year. It then starts to increase in September and peaks in October before trailing off for the remainder of the year. 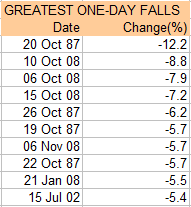 So, according to this study of daily returns throughout the year, October is indeed the most volatile month. Having looked at the daily volatility profile for the 12 months of the year, let’s now look at how daily volatility has changed over the past three decades. 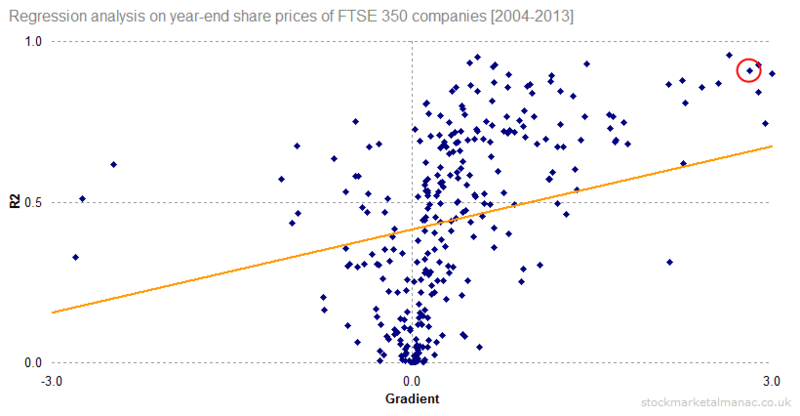 The chart below plots the standard deviation of daily returns of the FTSE 100 Index on a 50-day rolling basis for the period 1985-2014. Over the past three decades there have obviously been periods that saw great spikes in volatility (notably: Black Monday in 1987, the sell-off in 2002, and the credit crunch in 2008). 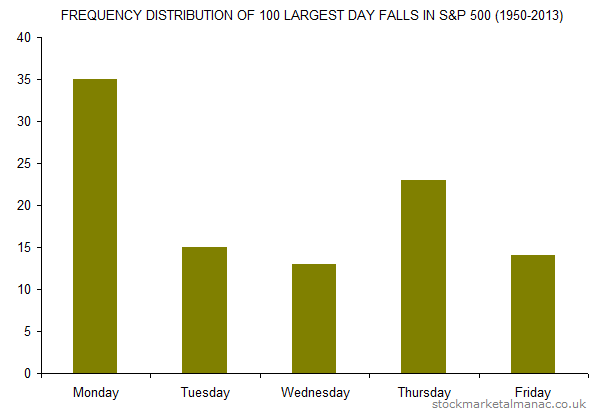 However, overall levels of daily volatility have not changed greatly over the period. The (50-day rolling) average daily volatility since 1985 is 0.99 and currently stands a bit below that at 0.83. As can be seen, since the spike in daily volatility in 2008, the trend of daily volatility has been down – reverting to the mean daily volatility for the period. At the time of writing, the 50-day rolling average daily return is 0.058% with a standard deviation of 0.83. 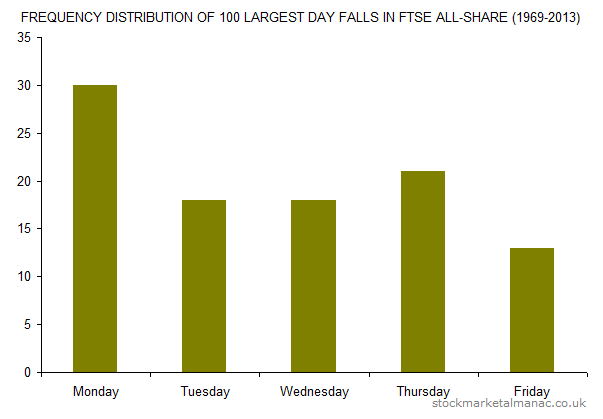 This means that in the past 50 days, 16 days (32% of the days) have seen daily changes more than +51 or less than -57 points in the FTSE 100.